"Thank you so much for working to create my vision for the quilt!" " I love everything about it from the fabrics to the painting to the stitching! I will keep this forever! I am sure I will work with you again as I love to create personalized items for myself and my family!! Whenever I have a child I will get one made for him/her! I absolutely love the quilt!" "The quilt is the most amazing beautiful piece of art! I love everything about it." "I didn't tell my daughter it had arrived. I just spread it on her bed and waited until she got home. I went in to see what she was doing and she was sitting on the bed stroking the quilt and crying." "The quilt is wonderful! She was snuggled into it when I left this morning. Thank you! Thank you! It is so beautiful. 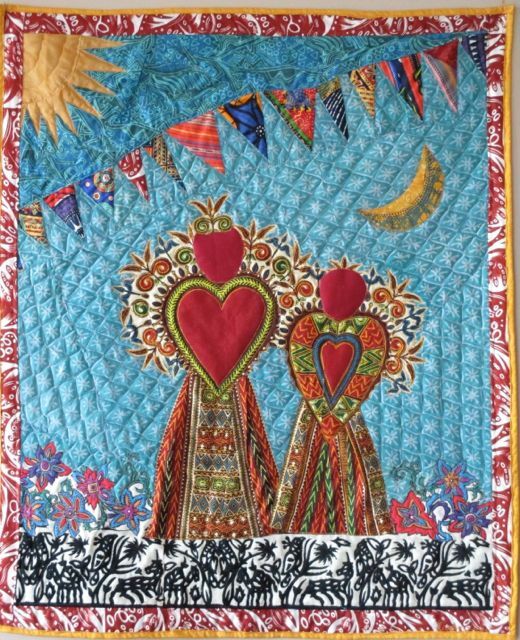 I cannot find the words to express how much the quilt means to both of us." 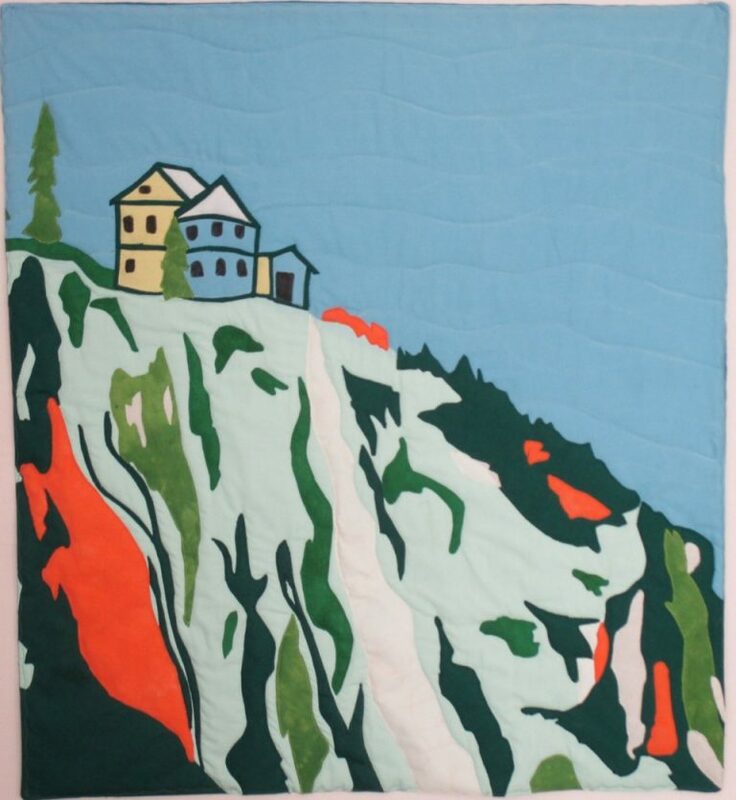 A mother commissioned this quilt for her daughter, who was leaving home to go to college. She sent me photos which I re-sized and then had printed onto fabric by a commercial company that specializes in high-quality colourfast images. These photos, which commemorate important events from infancy through young adulthood, were sewn into a medallion-style quilt. The daughter's favourite colours were chosen for the borders and frames around the quilt.
" I love the quilt! All of the designs are beautiful! I really like your idea of putting us in the photo with him!" 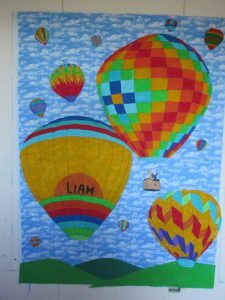 This client wanted a quilt for her two-year old son featuring hot air balloons in primary colors, with her little boy in one of the balloon baskets. I painted the balloons with acrylic fabric paint, then appliqued them onto the cloud background. I suggested adding mom and dad and printed a photo of the family onto fabric, then put them all up in the air in the basket. I am very happy with how it turned out. It is perfectly fine and I love the colors. I am very grateful for your effort." I was asked to make a small baby quilt based on the parent's wedding invitation, which looked like a vintage travel poster. This was a complex project, as every element had to be cut out separately with an Xacto knife, then placed precisely and machine-appliqued onto the background. Perhaps this is an unusual quilt for a baby, but hopefully it will accompany her throughout life as a wallhanging. 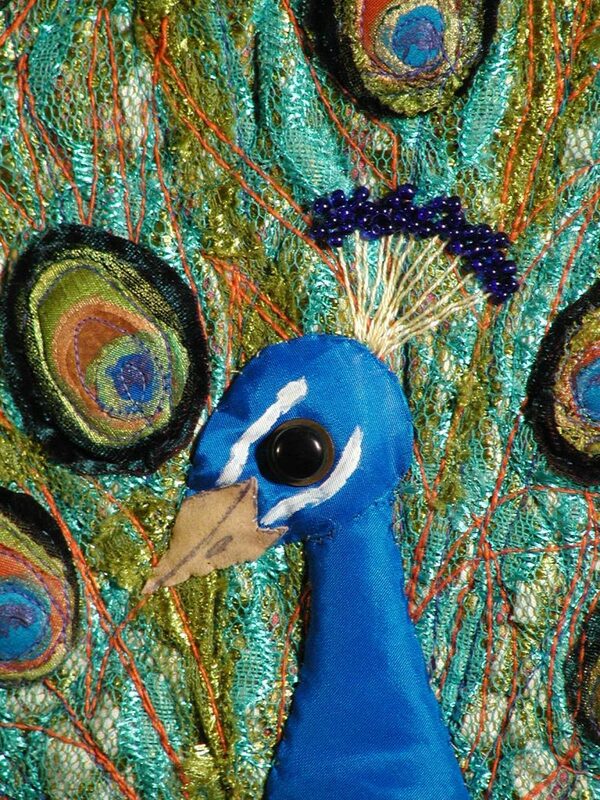 Get in touch if you have an idea for an unusual quilt! "Your photos did not do the quilt justice. It is amazing. I know my girlfriend will love it. Thank you again for making this awesome quilt. Very grateful. The details make this quilt. Can't say thank you enough. " I'm always thrilled when a client orders a second quilt. This time I was asked to make a baby quilt that depicted a mother and daughter of Mexican and African African heritage. But I was also hesitant, as this is not my own heritage. I dug through all my fabric looking for suitable material. Scraps from a vintage dashiki provided the hearts that became the basis of the two figures, and I chose other bright-colored fabrics that enhanced the theme.